Tips on Collecting a Swab Sample Cheek swabs are the easiest, least invasive means of collecting cells containing genetic material from your dog (see this post). It’s a simple process that we cover in the instructions sent with your kit, but here’s a little more information. As always, if you have any questions, please don’t hesitate to contact us at askus@pawprintgenetics.com or 855-202-4889. After reviewing the form that came with your kit, you’re ready to start the collection process. It’s best not to take samples from a puppy that hasn’t been weaned because some of the mother’s DNA can be present due to nursing, which can contaminate the sample. Also, it’s best to wait for at least an hour after the dog eats before attempting to swab; excess saliva and food particles can compromise testing and reduce the quality of a sample. Each swab in the kit comes in a hard-plastic tube. This is to protect the sample during shipping and to minimize contamination. Do not discard the tubes after removing the swab. As you use each swab, put the tube aside in a clean place where it’s unlikely to come into contact with pollutants, especially another dog’s hair or dander. After removing the swab from the tube, take care not to touch it or allow the cotton tip to come into contact with anything that could cause your dog’s DNA to be compromised. The actual act of swabbing is simple. 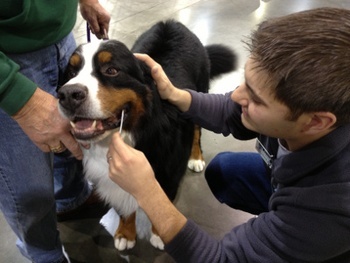 The main goal being to obtain as many skin cells from your dog’s inner lip/cheek as possible on the tip of the swab. To do this, simply lift your dog’s upper lip and insert the swab between cheek and gum line. Using gentle outward pressure, swab the inside of the cheek in a back-and-forth motion, turning the swab occasionally to coat the entire tip with cells. Do this for about 30 seconds. After removing the swab from your dog’s mouth, take caution not to let the tip touch anything – a tabletop surface, your skin or anything that could soil and contaminate the tip. Carefully place the swab back into the tube and set it aside while you repeat the process with another swab on the opposite side of the dog’s mouth – where you’ll likely gather more cells than if you repeated it in the same spot. When you’ve successfully collected your samples, place the tubes containing the swabs into the orange biohazard bag. Place the biohazard bag containing your tubes and swabs inside the mailer provided (or any other protective packaging), along with your reviewed information form, secure it and drop the package in the mail – we’ve already handled the postage, so you don’t have to worry about it! You’ll receive notification when we receive your samples, and you can always track its progress in the testing process on our website by using the secure account you created at registration.